Yeah, horoscopes and zodiac signs are fun to read and sometimes eerily “right”. I don’t know how many times a friend of mine would read her horoscope and thought it was, without a doubt, talking about what she was going through at the time, especially when it came to her relationships. But once you really think about it, everyone is going to, “try to surround themselves with people who they trust.” Sorry ‘Yahoo horoscope’, that’s not advice specifically for Capricorns. 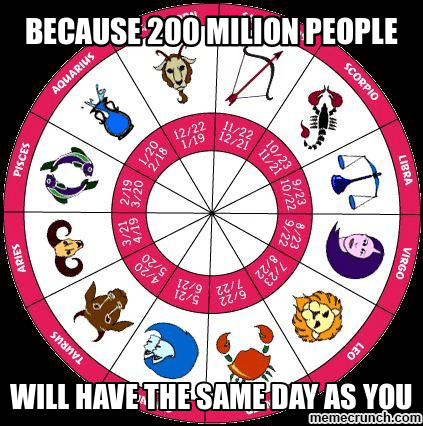 Are you still an avid believer that those daily overviews of your horoscope are 100% true? Before you take those couple of sentences you find in your daily horoscopes too seriously, you might want to read a couple of these horoscope myth-busters. The whole zodiac system was developed when people beleved that good ole Earth was the center of the universe. They were wrong about that one. Plenty of astrologers have been challenged to provide evidence of whether or not your personality correlates with your birth date. None have done so, probably because they can't. They added another constellation to the Zodiac! How are you going to add another constellation when we already have a set 12, you ask? That really confuses the whole, “Am I really a Taurus?” question. 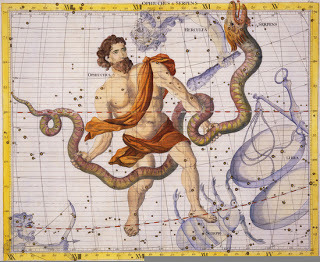 The newest sign is named Ophiuchus. They don’t have traits for that sign, but shouldn’t they? What if you’re a Ophiuchus? What if your girlfriend isn't a Scorpio anymore? Are you no longer meant to be? Do you have to break up? Yes, there are rumors saying that Ophiuchus isn’t a part of the zodiac astrology but they probably came from horoscope websites that don’t want to change up or confuse any of the firm horoscope believers. We all know if we’re loving, smart or compatible with our partners. We don’t need a paragraph telling us that we are. (If you do, I don’t know what to tell you.) But it goes beyond that. How is a paragraph going to tell me if I am destined for greatness or that something surprising is going to happen in my love life today? First of all, those are ridiculously vague and can apply to anyone at any moment. You don’t need to have stars be aligned in a certain way for you to ‘have enough courage’ to tell your secret crush how you really feel. Be courageous at any moment! The planets are influencing us….WHAT? “All areas of your life receive the benefits and blessings of Jupiter.” That was an actual sentence I just read off of the horoscope of Cancer. Now that’s just silly. How can all my blessings come from Jupiter? Unless that’s part of your religion, I don’t believe it. What if you’re a Christian or Catholic? Wouldn’t thinking that your blessings coming from a planet contradict what you believe in? Can a placement of a planet really tell how we’re feeling or what’s going to happen to us in a few years? When they add dates, that bothers me. It’s like saying: don’t do anything on those days. I don’t know if people actually follow no-go dates or not, but what if you miss your chance on something because your horoscope is telling you to be “cautious”? Are you going to miss your first date with a hottie because Jupiter's misaligned? I don't think so. Who writes these horoscopes anyways? Aren’t they different for every website or magazine? Your life is your life. Don’t base your decisions on whether or not you are lucky on the 14th. Your characteristics, personality and fate aren’t determined by what month, year or time you were born. You are you because that’s who you are. Don’t get me wrong, reading horoscopes are fun and whenever I see compliments under my sign, I obviously agree with them (who wouldn’t?). But don’t make, ‘It’s because I’m a Sagittarius,’ a reason on why you’re so blunt. You’re blunt because you’re blunt. You love traveling and exploring because you’re a Sagittarius? I’m pretty sure everyone likes to do those things at one time or another. Next time someone asks you what sign you are or read what your horoscope is for the day, don’t take it too seriously. Afterall, it’s all fun and games anyways.